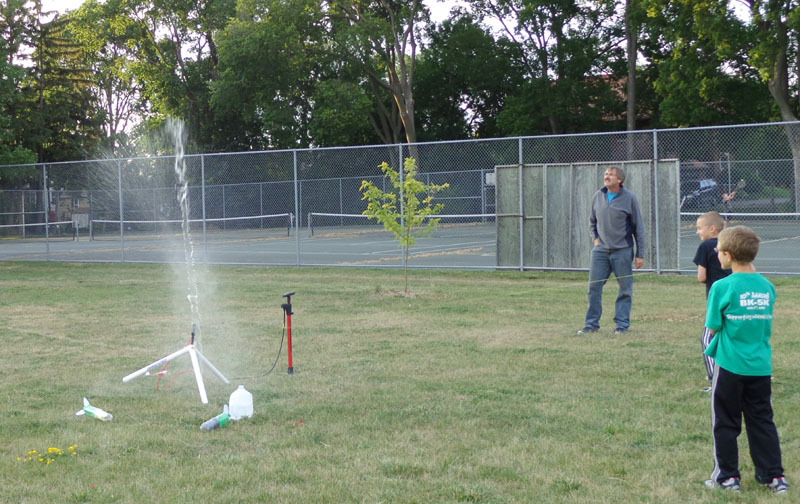 What a thrill pulling the string to release all that potential energy in a water rocket. Water rockets is probably the physics-related activity that I have been part of with the largest number of kids in the last few years, before that it had been rubber powered model planes. 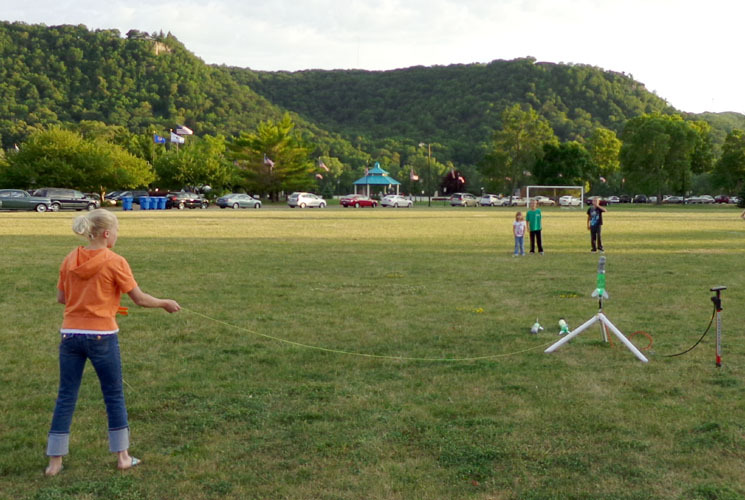 My idea to try water rockets was when the local park and recreation had a summer camp for model planes and rockets. The solid fuel rockets are sure fun but rather expensive when doing many launches. I thought water rockets would be less expensive so I purchased a launcher and started designing water rockets. 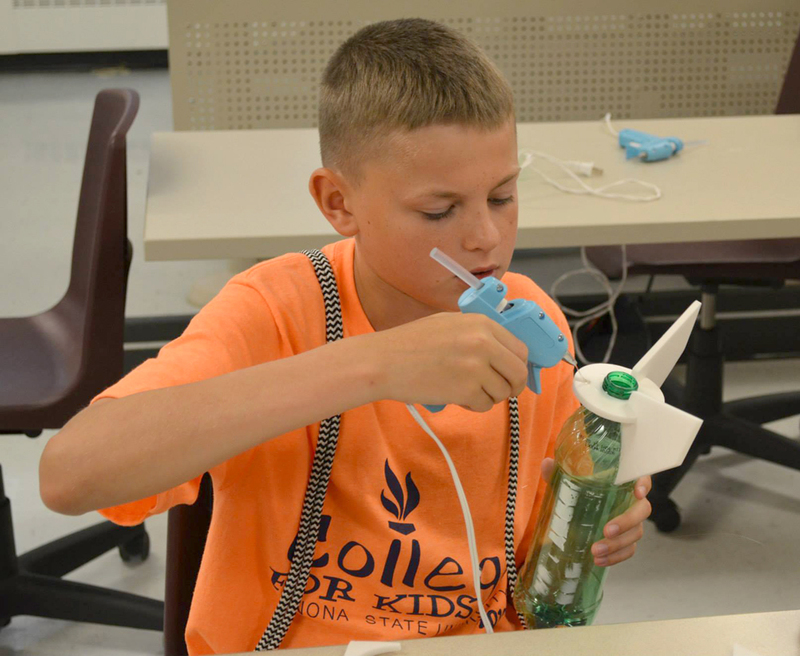 An enthusiastic group of summer campers enjoyed building and launching water rockets. Kids really enjoy the water rocket activity and I received this card as proof. 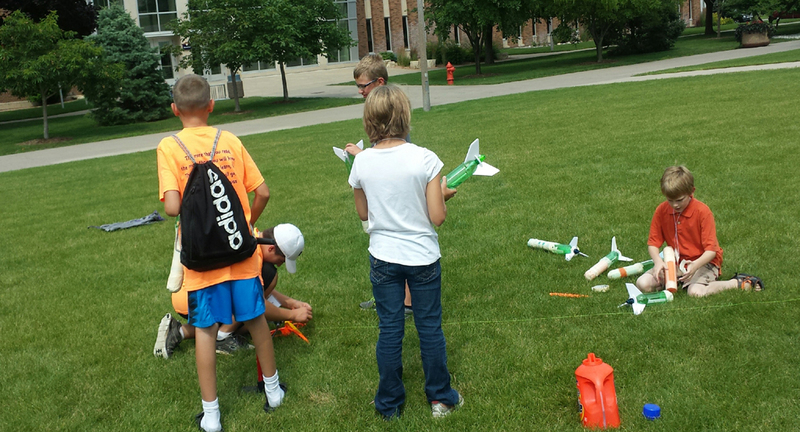 When building water rockets with a large group of kids it sure helps to be organized. With the kids on the outside of the tables I could quickly reach them from the inside of the tables. I have to credit park rec staff for this idea. For this group there were more kids in a smaller room so the table square idea would not work. Through the process of trial and error I came up with a simple water rocket design that works well for group builds and launches. By using 24 ounce or smaller soda bottles finding empty bottles should be easier and fill more quickly with less water than using 2 liter bottles. The fan fold foam fins can be cut using a hot wire cutter sold for model railroading. Foam swimming noodles are used for a rocket nose that will absorb the shock of repeatedly hitting the ground. Tape over the end of the foam will give it enough stiffness for the high-speed launch and cover over the hole at the end. 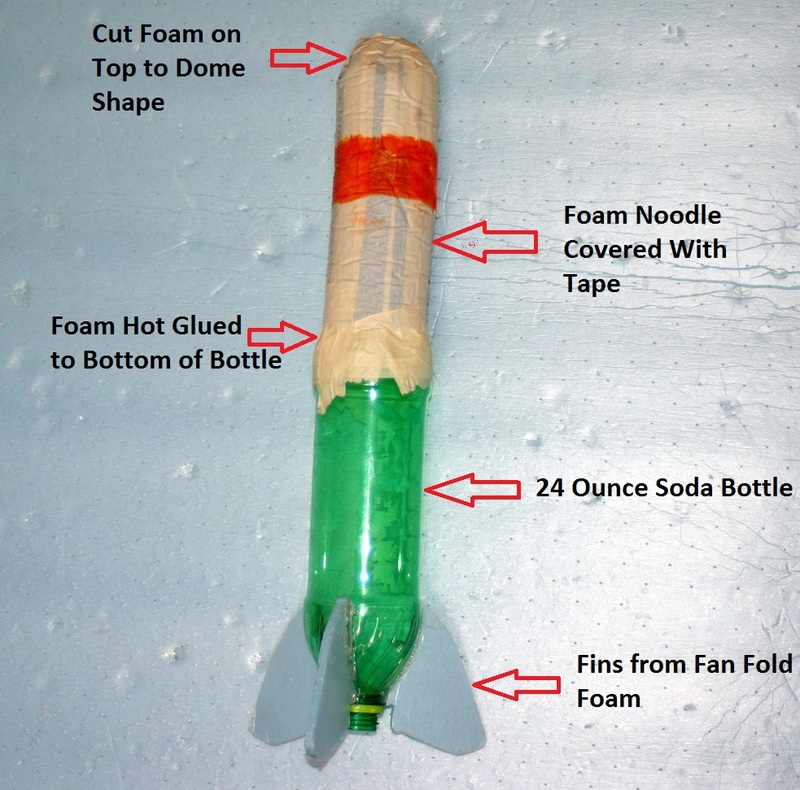 Low temperature hot glue guns attach the few parts needed for this rocket in a hurry. 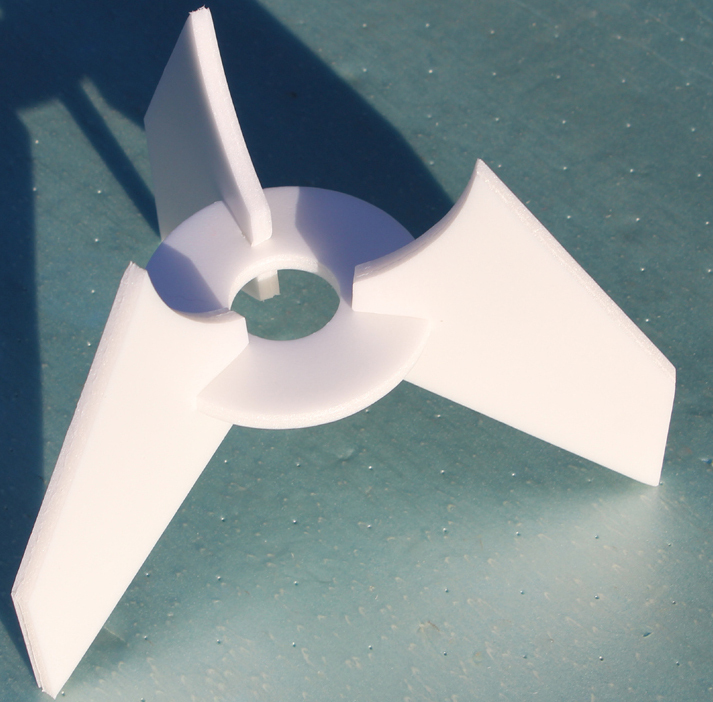 Left – fan fold foam normally comes in a large size which will make a huge number of rocket fins. If only a smaller amount of foam is needed foam from the flat sections of foam meat trays can be used instead. Right – foam noodles can often be found in many stores or even at dollar stores. I used the hotwire foam cutter to cut into shorter lengths. Left – I had created by own hotwire foam jigsaw to cut out the foam fins. Right – the Woodland Scenics Hotwire Foam Cutter will work equally well, often sold where model railroading supplies are sold. Left – I created a template to draw lines for the location of the fins. Right – foam noodle section is trimmed with a scissors on top to create a “dome shape”. The only equipment really needed for water rockets are a pump, water rocket launcher, and a method for pouring water into the rocket. Some people construct a launcher but I purchased the PITSCO Aqua Port Launcher which has worked very well. Considering how many launches can be done with the launcher at no cost I feel it was a good investment. Left – a good quality tire pump is needed like the one in foreground the cheap one in the background did not hold up and had no pressure gauge. Middle – a water rocket launcher should have a strong clamping mechanism to hold the bottle under pressure PITSCO Aqua Port pictured. Right – it makes it easier when you have an easy method for filling the rockets with water. 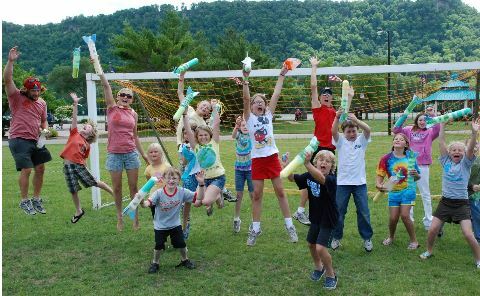 Water rockets are sure a fun activity but it can also be a good way to expose young people to physics. 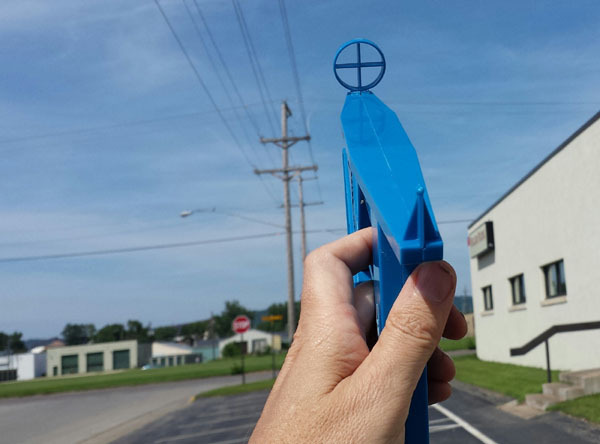 One of the lab questions I see often is to relate water rockets to Newton’s Three Laws of Motion. Lab activities of estimating maximum altitude or trials with varying amounts of water is popular. 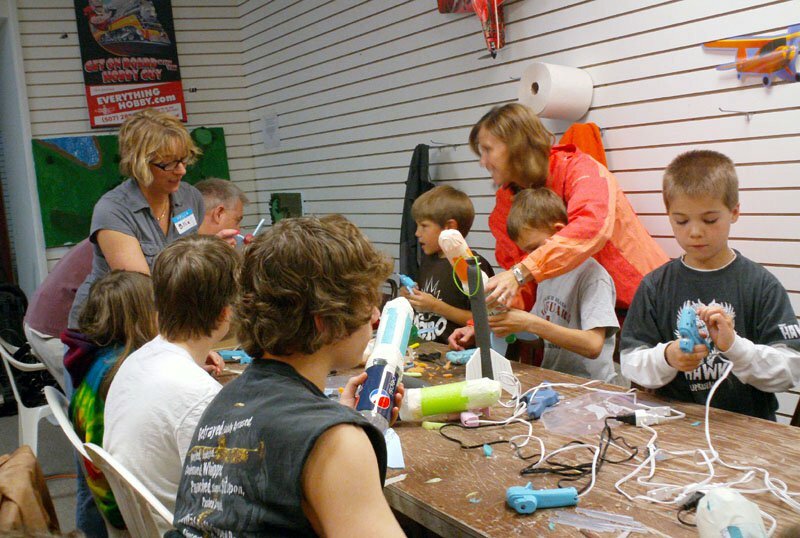 If students are designing their own rocket there are several factors that will contribute to the performance of the rocket. It is my plan to continue to update this webpage with more information that will be address the educational aspects of water rockets. How Does a Water Rocket Work? Air is pumped into the chamber created with a plastic soda bottle causing pressure to build. Normally an amount of water has been added to the bottle prior to pumping in the air, this water is forced out very quickly when the rocket is released. The water is a “reaction mass” and increases the maximum height the rocket will obtain considerably. Fins on the rear of the rocket and creating a rocket with the proper balance point help give the rocket stability. The reaction mass water is completely expelled within the first 10 feet of the launch and then rocket continues skyward powered by kinetic energy opposed by the forces of friction from the air and gravity pulling down towards the earth. Understanding this in more detail should provide a fun learning experience. 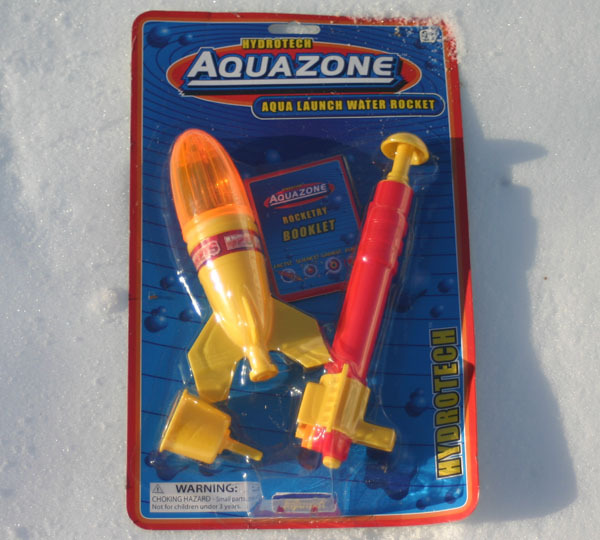 My first exposure to a water rocket was this small toy rocket that came with it’s own pump, launching mechanism, and funnel. It is easy to see from this picture that at a height of around eight feet all the water has been expelled from the rocket. 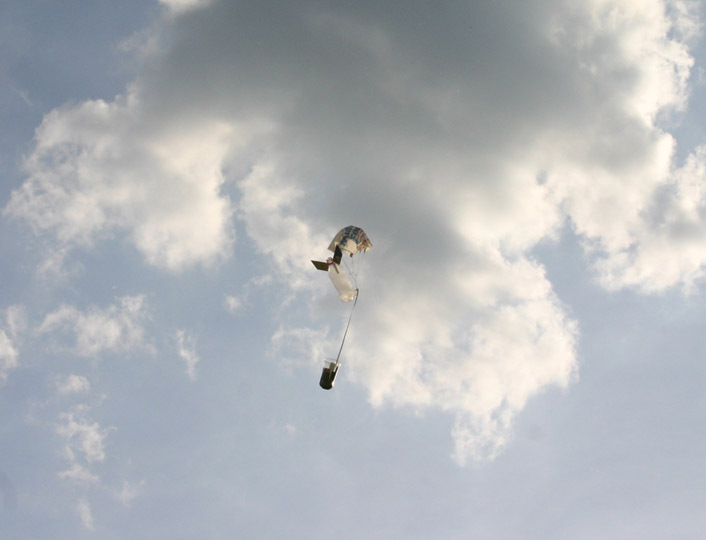 The AntiGravityResearch rocket with a small hole for a nozzle releases a small stream of water over a longer time period and distance. Think in terms of work and power, with a smaller stream of water work is being done over a longer period of time. What type of power would this be called; high or low? 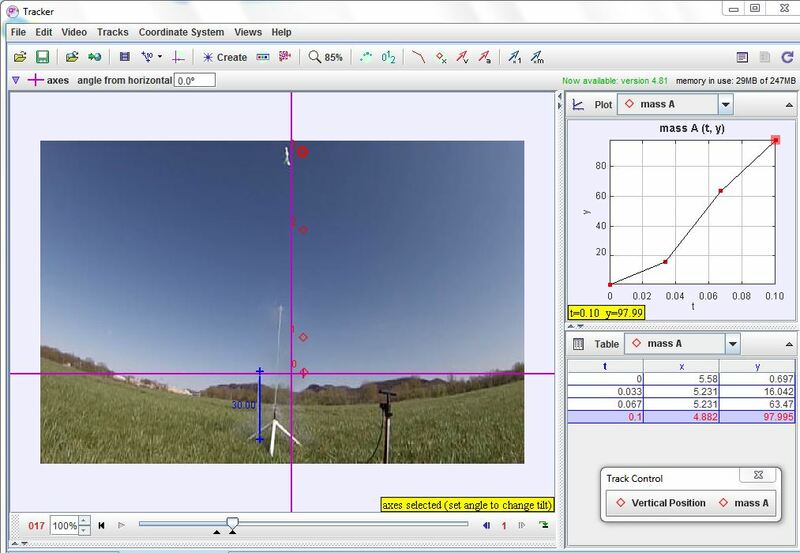 I learned of an awesome tool for analyzing motion by importing video segments into a free software program known as Tracker. It was through the book, “Fun Physics Projects for Tomorrow’s Rocket Scientist” that I was exposed to using the Tracker program and I happen to find this book as a webpage of mine was listed as a resource. Briefly describing this program; video is imported and then can be analyzed on a frame by frame basis. Included in your video is an object of known length as a reference so the program can calibrate measurements to the reference. The program can then create graphs and generate data. In the future I plan to work with this program more. Average speed 55 mph, first segment 33 mph, second segment 96 mph, and final segment 70 mph. I had read somewhere that a water rocket can be going over 100 mph a few feet after launch so I think my calculations sound reasonable. Probably one of the most common lab exercises with model rockets is to estimate the maximum height the rocket reaches, this point is known as the “apogee”. The most common method of doing this is to use a little simple trigonometry with the tangent function. If you measure the angle from where you observe the launch to the apogee and also measure the distance horizontally across the ground then with a simple formula as estimate for the maximum height of the launch can be obtained. Why I say estimate is because there will be some inaccuracies of the measurement of the angle of the launch and to the distance of the rocket over the ground when it is at the apogee. This exercise is often done with multiple trials to record data and then average the data. To find the angle to the apogee a protractor with a weighted string can be used or Estes sells a device known as the “Alti Trak”. To use the Alti Trak you pull in a trigger to let a weight swing free and when the apogee of the launch has been sited, let go of the trigger and the angle will be recorded. Measure on the ground with a tape measure to the spot below where the apogee occurred. Best to try this when there is little wind and give an allow for drift to the landing spot. I practiced siting with the Alti Trak using the tops of utility poles which remain stationary. It will be tougher to site to the apogee of the launch which happens so quickly. With the angle sited to the apogee and the distance on the ground to the rocket the calculation of maximum height is simple. Enter the degrees into a calculator with trig functions and then press “tan” key for tangent, multiply the result by the distance on the ground, this will give the maximum height obtained. As there is plenty of chance for inaccuracies in the data it is best to do several trials and use the average. Launching a model rocket is always exciting but the final cool factor is after a lightning fast launch the rocket comes slowly to earth by parachute. This is easy to do with a solid fuel rocket with an ejection charge but more difficult in a water rocket without the ejection charge. I tried several approaches implemented in many rockets. When the parachute fails to come out it can be hard to figure out what might have gone wrong as the rocket is wrecked badly in the crash. First Timer Rocket After trying several variations of the “fall off nose” parachute deployment and never really perfecting it to be completely reliable I decided a new approach was needed. From my research it appeared that many water rockets were using the wound spring mechanism in a plastic case often referred to as the “Tomy Timer”. This is a generic term but the source I use is from Texas Timers, click on Plastic Clocks to order the mechanism. For my first water rocket using the timer, I had a compression spring held down and the timer released the spring connected to a rod that pushed the nose off. The first few launches this worked perfect, I thought reliable parachute deployment had been achieved. With more launches the system failed and the rocket was wrecked. I still thought my idea of pushing the nose off with spring tension would work if only there was a little more force pushing the nose off. This time I had a large disk pushing the nose off. The disk was connected to a rod that had tension springs connected to the bottom of it pulling the rod upwards when timer released it. Worked great on the ground but it didn’t take too many launches to find out this was not reliable. The most consistent parachute deploy has been with a hatch on the side of the rocket using the tomy timer with a rubber band that goes across the hatch and unwinds wrapped around the timer mechanism shaft. The hatch has a springy wire hinge that tries to open up when the rubber band is not holding it back. After so many failures trying to push the nose off I theorized that the air pushing against it as the rocket moves at speed was pushing the nose back on even if it did push off successfully. This book is about solid fuel model rockets but I found some good information in it. I purchased the Quest Water Rocket system at local hobby shop as the price was reasonable for the launcher. 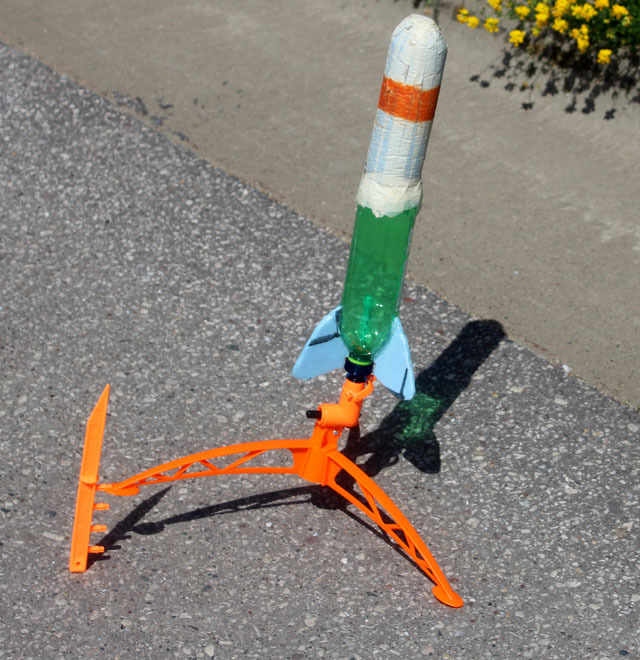 The launcher fits an adapter that is on each rocket opening and reduces the size of the water stream coming out. When launched the thrust portion of the launch is longer than a rocket that propels the water out an unrestricted opening. Height was pretty good but not at high as an unrestricted opening. For a summer camp that had a smaller area for the rocket activity it worked well. The Quest Launcher with rocket that has my fin design. The fins made of foam, interlock which helps with alignment and are more likely to stay on the rocket with repeated launches. To keep the adapter from leaking I found a second gasket was often needed and adapter tightened with pliers.